Asparagus is a fantastic vegetable – it is crunchy and tender at the same time, it has a unique taste and best of all asparagus is incredibly rich in nutrients. 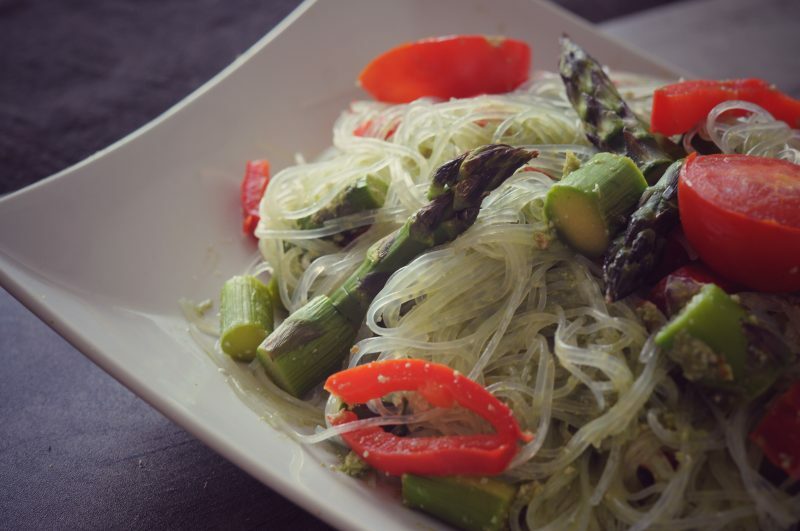 It is also surprisingly easy to cook it and mix with other ingredients – you can always mix asparagus with vegetables and noodles, just like in this recipe! To make it more interesting we added our favourite green pea-sunflower pesto, that will suit any diet: there is no oil, no sugar and no dairy in this super easy noodle recipe. Step 1. Cut asparagus, cherry tomatoes and bell pepper and roast them together in the oven for 15-20 minutes at 200 celsius. Step 2. Cover glass noodles with boiling hot water and set it aside, until other ingredients are ready. Step 3. Wash peas in hot water or thaw them in advance. Add peas to a blender together with sunflower seeds, water, lemon juice, garlic and salt. Process together until the mixture becomes smooth, just like pesto. Step 4. Drain the noodles and mix them thoroughly with the pesto. Step 5. Add your roasted vegetables on top. Your glass noodles with asparagus and pea pesto are ready – enjoy it in a good company!